You’ll love the hint of caramel, thick layer of brown sugar icing, and sprinkling of pecans featured in these Pecan Praline Amish Sugar Cookies. 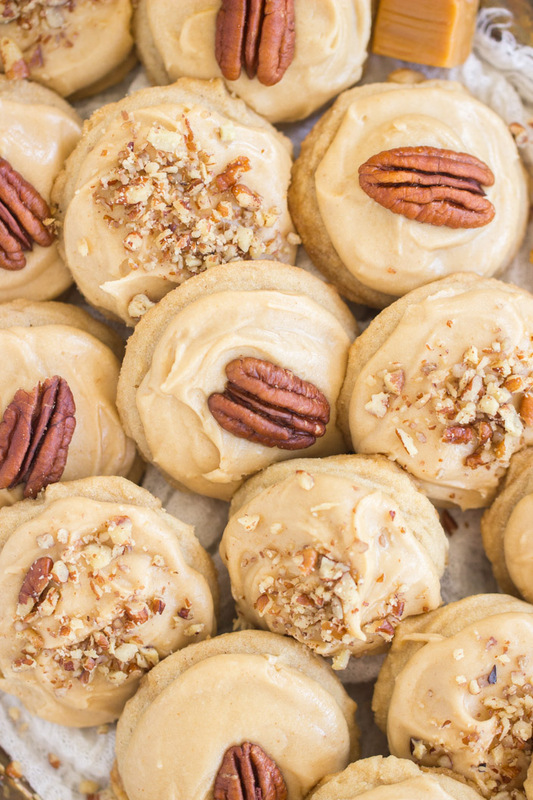 And they’re so puffy, pillowy, and soft — these Pecan Praline Amish Sugar Cookies literally melt in your mouth! 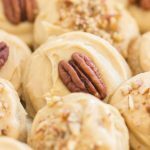 I thought I was done baking all the variations I was going to share in 2018, but these Pecan Praline Amish Sugar Cookies were a last minute throw-in. I can’t remember what compelled me to decide that I needed to make yet another version, but here they are! 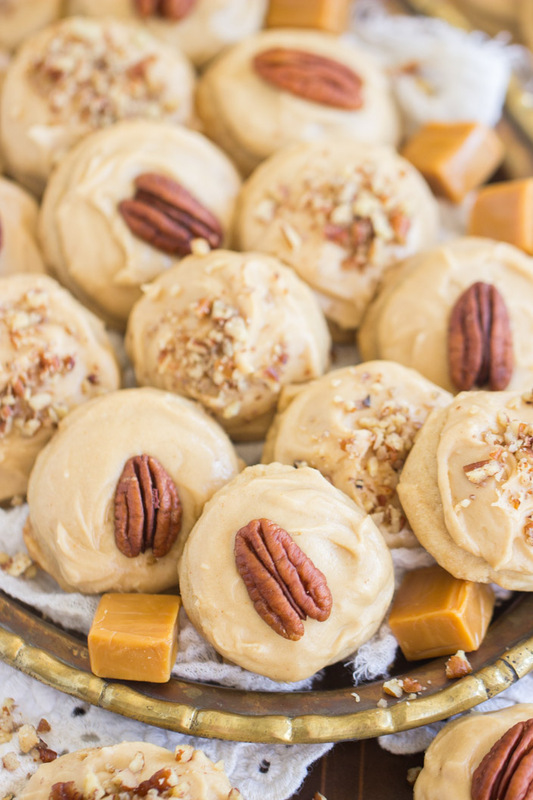 The cookies are tinged with caramel flavoring, and they feature a thick layer of caramel-brown sugar icing, as well as a sprinkling of pecans. 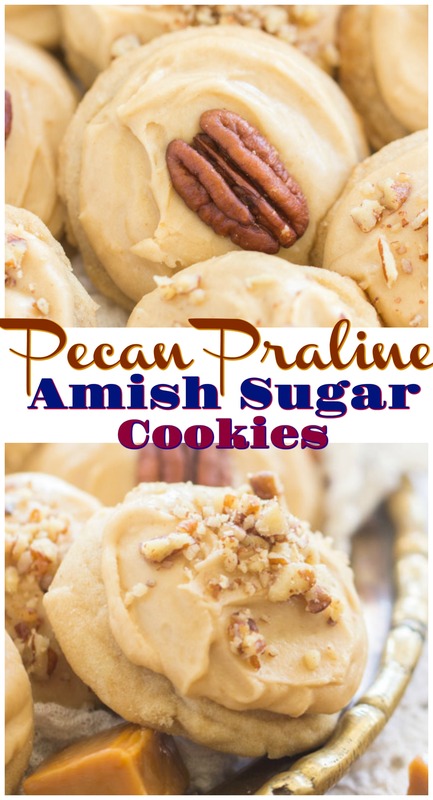 These Pecan Praline Amish Sugar Cookies still retain the best features of traditional Amish Sugar Cookies: they’re a lot like a cut-out cookie, but they’re a drop cookie, so they’re a fraction of the work. No chilling, no rolling & cutting. They’re very soft, puffy, and pillowy. 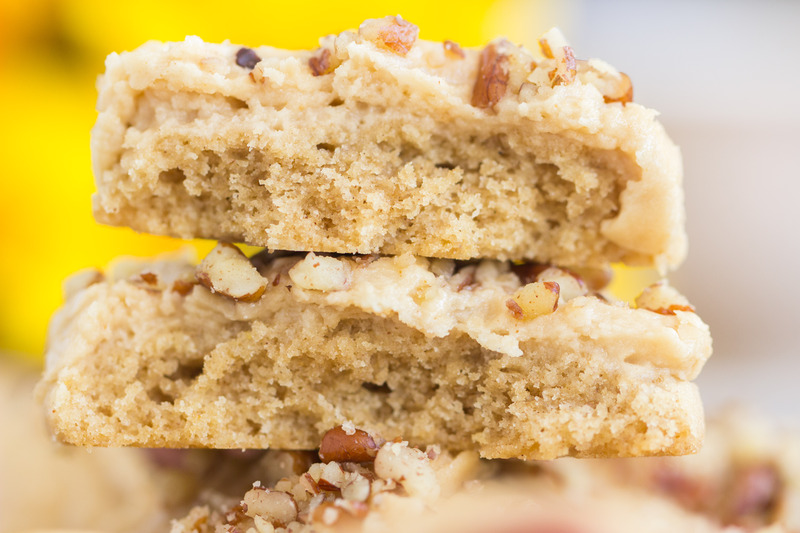 The texture of these is unmatched, and that stays front and center in these Pecan Praline Amish Sugar Cookies. The praline theme is somehow exceptionally fitting with Amish Sugar Cookies. 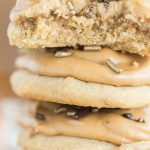 Maybe it’s because a cookie that is already buttery and boasting melt-in-your-mouth texture, is all the more enhanced by a buttery, caramel-y brown sugar icing. That’s just the start. Here’s allllll the different ones I’ve got so far if you want to explore your options! 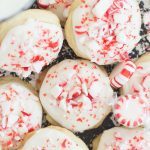 Don’t forget that Christmas isn’t too far away, so you’ll be seeing more of these Amish Sugar Cookies before you know it. 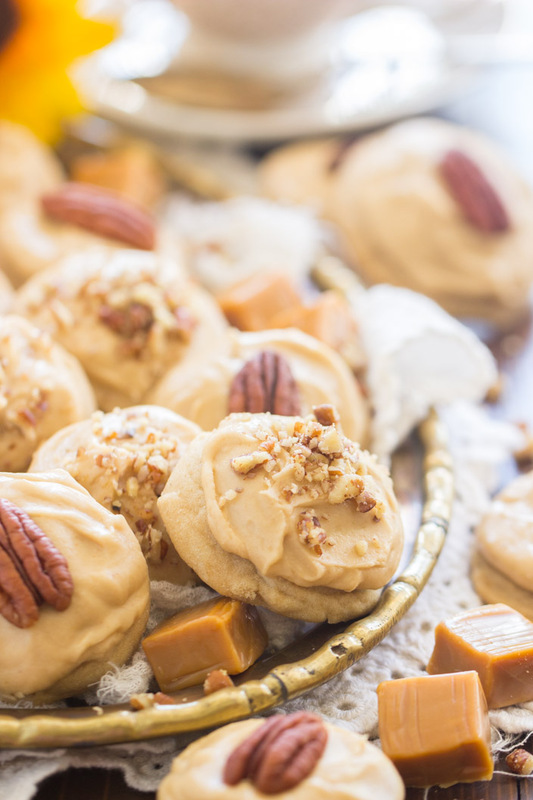 You'll love the hint of caramel, thick layer of brown sugar icing, and sprinkling of pecans featured in these Pecan Praline Amish Sugar Cookies. 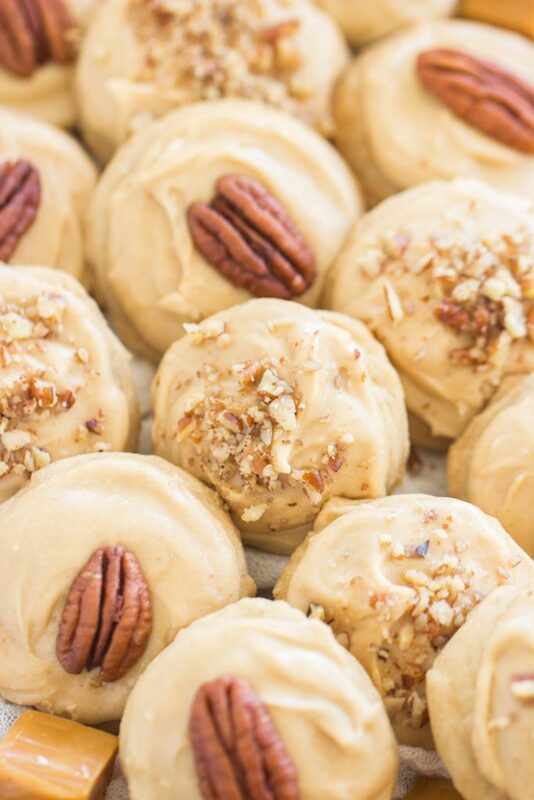 And they're so puffy, pillowy, and soft -- these Pecan Praline Amish Sugar Cookies literally melt in your mouth! Beat in eggs, vanilla, and caramel extract. Add brown sugar, vanilla, and caramel extract, whisking to combine. Bring to a simmer and cook until sugar is dissolved, stirring frequently, about 3 minutes. Bring to a boil, stirring constantly, then remove from heat. Whisk or beat in 2 1/2 cups powdered sugar. 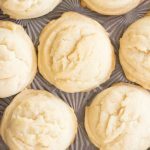 Add additional powdered sugar, as needed, to achieve a thick, but spreadable consistency. 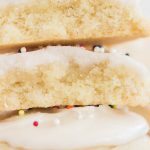 Frosting sets quickly, but you can microwave it for 7-8 seconds (that's it) to thin it back out for spreading, as needed. 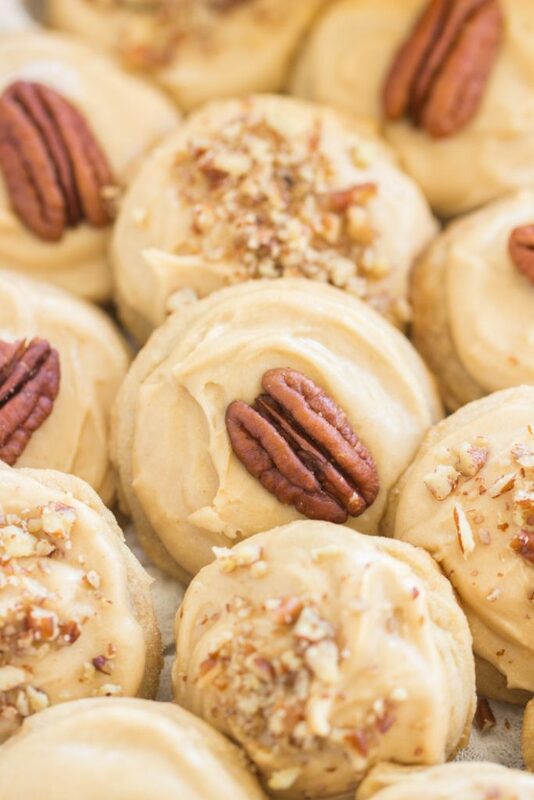 Spread icing over cookies, sprinkle with pecan halves or chopped pecans, and allow to set. I find Watkins' brand caramel extract easily at Walmart Neighborhood Markets and Walmart Superstores. There are probably other brands of caramel extract and flavoring too! 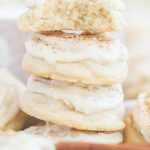 I've made these Amish Sugar Cookies into Iced Maple Amish Sugar Cookies, Pumpkin Spice Latte Amish Sugar Cookies, Iced Chai-Spiced Amish Sugar Cookies, Iced Almond Cookies, Iced Lemon Amish Sugar Cookies, Iced Orange Amish Sugar Cookies, Toasted Coconut Amish Sugar Cookies, Coconut Oil Amish Sugar Cookies, and Thin Crispy Amish Sugar Cookies! These sound delicious! I have a recipe for sugar cookies just like this; however, I’ve never used caramel extract. 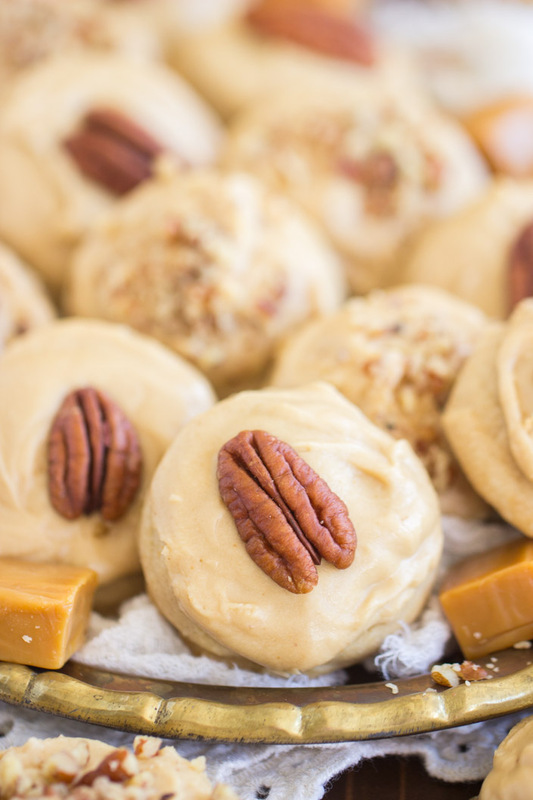 I absolutely love caramel, so maybe I should buy some. Thanks for sharing. Yes! I hope you can easily find caramel extract.. I usually find it at Walmart Superstores and Neighborhood markets. 🙂 It’s really good stuff! That would make for a seriously amazing breakfast! Lol! Oh! these look so good. Thanks for the recipe.